I believe the author Stephen King would hate the language of the Common Core State Standards for one reason: unnecessary adverbs. His book On Writing has a section devoted to explaining why The adverb is not your friend. The use of adverbs in this standard has led to more confusion, not less. The expression “read closely” was recoined as “close reading,” and that has resulted in parodies of teachers holding books up to their faces, mocking the standard. Why the writers of the Common Core felt the need to modify the action verb “read” at all is perplexing. Students must read to determine what a text says. That is all. The admonishment to “read closely” to determine what the “text says explicitly” infers the author is either trying to slip an idea past a reader or the author has been ineffective in communicating the idea. I am not convinced any author would appreciate this standard. Consider the sentence He closed the door firmly. It’s by no means a terrible sentence (at least it’s got an active verb going for it), but ask yourself if firmly really has to be there. You can argue that it expresses a degree of difference between He closed the door and He slammed the door, and you’ll get no argument from me … but what about context? What about all the enlightening (not to say emotionally moving) prose which came before He closed the door firmly? Shouldn’t this tell us how he closed the door? And if the foregoing prose doestell us, isn’t firmly an extra word? Isn’t it redundant? The phrase comprehend”more fully” sounds like a phrase from one of my student’s essays. I would equate the construct of “more fully” with “as a whole” or “the fact that” or the ubiquitous word “flows” found in my weaker writers’ responses. These are all phrases that receive a large NO! in red ink from me as I grade or confer. A reader comprehends or a reader does not. Students can only gain this foundation when the curriculum is intentionally and coherently structured to develop rich content knowledge within and across grades. Students also acquire the habits of reading independently and closely, which are essential to their future success. Digital texts confront students with the potential for continually updated content and dynamically changing combinations of words, graphics, images, hyperlinks, and embedded video and audio. Consider how the advice from King and the lesson from this video can be used by teachers in stopping the flood of adverbs and in applying the Speaking and Listening standard in a classroom where “Digital texts confront students with the potential for updated content and changing combinations of words”….. NOTE: continually and dynamically not included. The morning keynote address by Diane Ravitch set the agenda. Ravitch is an education historian and an author who served as Assistant Secretary of Education and Counselor to Secretary of Education Lamar Alexander under President George H.W. Bush. She was Adjunct Professor of History and Education at Teachers College, Columbia University; this Saturday, she returned to speak at Riverside Cathedral. She began by recalling another political era, calling the cathedral the “sacred space” where William Sloan Coffin had spoken out against the Vietnam War. This time Ravitch was speaking out against the war on public education. She began by alerting the enormous crowd of teachers about the Network for Public Education. This year-old network was established to, “Give the [us] the courage to fight; our motto is ‘We are are many, they are few, we will prevail’,” she claimed. She spoke of challenges in providing for the inequities in education, detailing that 25% of children today live in poverty, and she demanded to know how our public schools will survive when education reformers push to replace public schools that accept everyone with schools that are privately managed. She recounted instances of publicly funded charter schools that teach creationism and other “17th century STEM subjects,” and she railed against a push to eliminate local school boards. 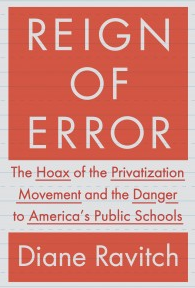 Ravitch continued her argument claiming that, “The education reformer narrative is a hoax, and they [education reformers] cannot win if they continue to perpetrate hoaxes.” She noted several indicators that speak to current successes in public education: falling dropout rates, higher graduation rates, higher minority scores on the National Assessment of Educational Progress (NAEP) test. Her objections to the CCSS are rooted in its creation, and in its rapid adoption and implementation in 45 states. “This small group [CCSS writers],” she continued, “was aided by the ACT and presented the CCSS as a fait accompli.” She added that the writing process of the CCSS was not transparent, and that, in violation of the National Standards Institute protocols,“there is no appeals process for standards that are seen as incorrect.” Moreover, although teachers were invited to “review” the CCSS, the standards themselves were implemented without a field test. Now the two federally funded testing consortiums, PARCC and SBAC, will spend the next two years testing these standards online. We must roll back what we see is a poisonous time…. I never met a child who learned to read because the schools were closed. No other nation doing this. We are alone in taking punitive action. 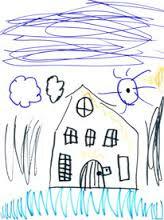 They [ed reformers] call it creative disruption, but children need continuity, not churn. Remember that a decent democracy equals values. Do nothing to stigmatize those who have the least. The cathedral reverberated with applause. I admit that I am the first to have heart palpitations the moment I hear a problem begin, “Say, a train leaves a station 500 miles east of the city traveling at 60 m.p.h…..”. Yet, given time, I am confident I can calculate the answer to a word problem, in part because my early teaching career included two years in a grade 8 pre-algebra class. At that time, I feared my expertise in English/Language Arts was not helpful for covering the math curriculum, so I taught as close to the textbook as anyone can imagine. I depended on worksheets. I was inflexible in my methods. I did exactly what the book suggested I do. Several weeks into the pre-algebra class, I told a fellow faculty member that I was concerned I could be doing more harm then good. Ms. C had graduate degrees in math, and she was responsible for the more advanced math classes. Multiplication tables…I could do that. If you drop the word “mathematically”, this standard measures any student’s ability to comprehend a problem, or question, in any subject area, and encourages students to be self-selective on determining the best way to solve a problem. In the English/Language Arts class, this “entry point for a solution” could be anything from selecting an independent book to read, to choosing a thesis for a research paper, or to picking a presentation software for an oral report to name a few examples. Mathematically proficient students analyze givens, constraints, relationships, and goals. In the English Language Arts classrooms, I teach students to analyze literary texts, fiction and non-fiction, for givens and constraints crafted by an author; to analyze the relationships between characters or author and audience; and to evaluate the goals these characters or authors achieve or fail to achieve. 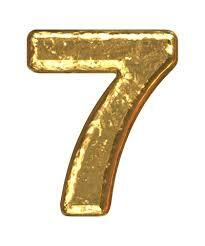 Mathematically proficient students monitor and evaluate their progress and change course if necessary. In the English/Language Arts classrooms, a student often begins writing with one idea or thesis, but by the end of the paper, the idea has changed; the thesis must be re-written. Students must monitor the progression of their ideas, and when the ideas cannot be supported or expressed, then they must change course in their writing. Mathematically proficient students can explain correspondences between equations, verbal descriptions, tables, and graphs or draw diagrams of important features and relationships, graph data, and search for regularity or trends. In the English Language Arts classroom, students should be able to explain the correspondence created with parts of speech in each sentence construction; they should understand the features and relationships created with punctuation; they should look for patterns in rhetoric; and they should be able to recognize the purpose of a selected genre used to communicate. English Language Arts students must read their writing and the writings of others while keeping in mind the question, “Does this make sense?”For the record, I add the question, “So what?” as well. The particulars in the MP#1 standard are not limited to mathematics as demonstrated in this almost line by line interpretation. All academic disciplines incorporate the ideas in this standard which, when combined, are the tools of perseverance. 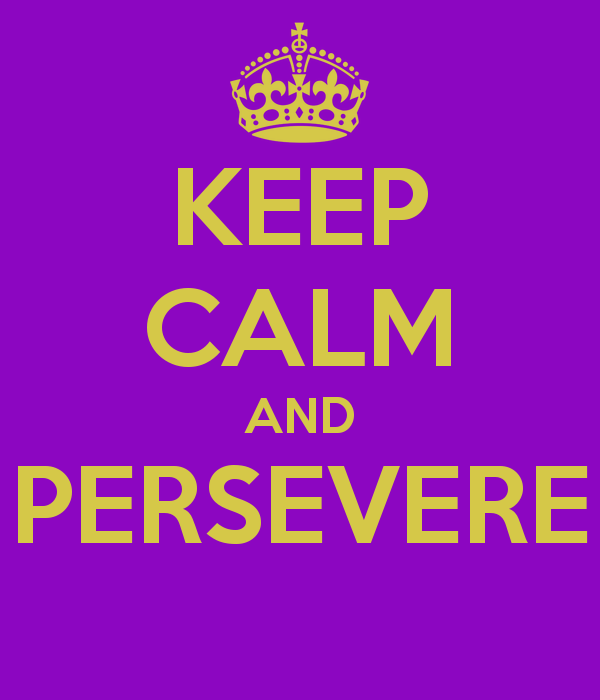 Teaching students to persevere is the ultimate goal of MP#1, and there are plenty of opportunities to practice perseverance in the classroom. The incorporation of technology in lessons at any grade level and in any subject can be such an opportunity. My school has a B.Y.O.D. (Bring Your Own Digital Device) policy for grades 9-12. Our grading system is online, assignments are visible to stakeholders, and almost all of my lessons incorporate some technology during the class period. I have learned first hand, however, that the use of any technology in the classroom requires perseverance because no matter how well a lesson is planned, SOMETHING WILL GO WRONG! For example: a link on a web page will not work; a platform selected by a student might need Java, which is not available on every device; another student will forget a password; or the network becomes overloaded when 30 students try and access a program at the same time. “Use a different browser,” I suggest when a link does not work. “Let’s reset your password,” I advise a student. “OK, Row 3? You will have to wait a minute before trying to log on…we can’t all access this site at once,” I might recommend. 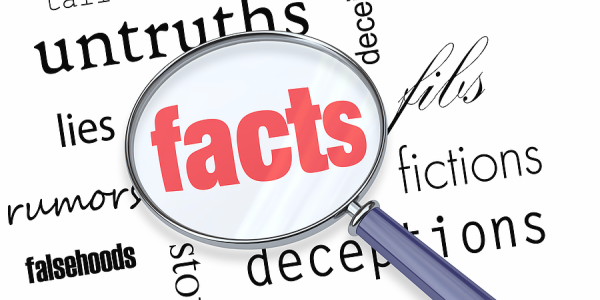 If nothing else, the Common Core State Standards’ (CCSS) contribution to the academic lexicon will be the renaming of the genre known as non-fiction to a larger genre of informational texts. This renaming expanded the genre to include many forms of reading: textbooks, letters, speeches, maps, brochures, memoirs, biographies, and news articles, to name a few. So where to find these informational texts? What is appetizing enough to make middle school students want to read a story, and then, answer the questions to check their understanding? What kind of high interest texts appeal to high school students who prefer to “Google” or “Sparknote” answers rather than read a text closely? What multi-media elements could be added to make an informational text palatable enough to be consumed by all levels of readers? The article is timely since the CCSS requires that the student diet of reading should be 70% informational texts and 30% fiction by the time they graduate from high school. The Literacy Standards specifically address reading in math, science, social studies, and the technical areas and recommends the increase in reading informational texts be completed in these classes. One of the technical areas content area classes could be a culinary arts class, a marketing class, or a health science class, but consider this particular informational text as scrumptious for any class. 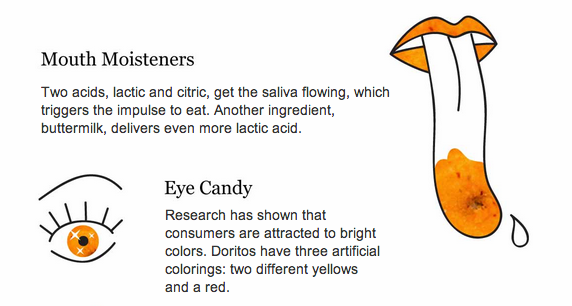 HOW do the acids in Doritos work on the brain? WHERE do half the calories in Doritos come from, and, according to the graphic, HOW does that work on the brain? WHY is “forgettable flavor” so important to Doritos’ success? Now that you know the formula behind Doritos, are you more likely to eat more or less of them? WHY? HOW many processed foods do you eat a day? WHAT might a graphic explaining the effects of this food look like? So go ahead. Read the Nacho Cheese Doritos article. See how irresistible an informational text can be. Once you read one this good, you will be searching to find another!